Absolutely awesome “REAL” cheesecake. Not one of those “no cook” pie pan things. And it is easy… so easy with only six ingredients. Just follow the easy step by step photo instructions. Editor’s Note: Originally Published December 20, 2013. Updated with expanded discussion and updated photos. Comment Note: This is not a “for two” recipe and will not scale down. It is a full-size 9-inch cheesecake. If you want to complain in the comments, I will just delete it. It is “impress the family and friends” time with this easy make at home cheesecake that will leave them asking for the recipe. It is about as foolproof and simple as a cheesecake recipe can get. This recipe has been floating in our pantry for many years and used when we remember it. We always say we will do it again, but it goes back in the pantry. The recipe was also on my original recipe site but again buried in the list. It just got no love. But now you can help give it some love. No water bath, no aluminum foil and no handling like it is going to break. This recipe was originally was passed around the grade school where my wife was the librarian about 20 years ago. 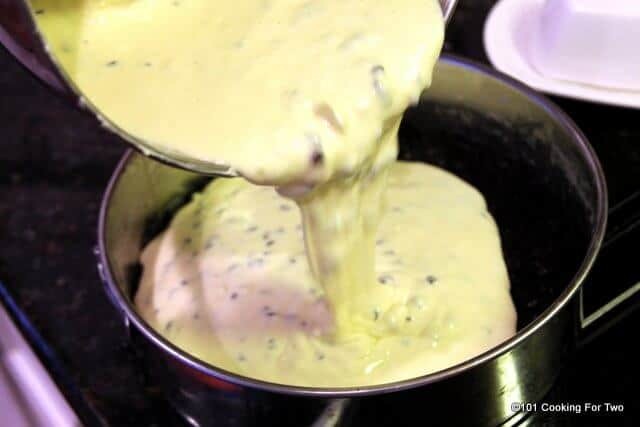 The batter is cream cheese, eggs, and sweated condensed milk. The crust is mushed up Oreo cookies with butter. 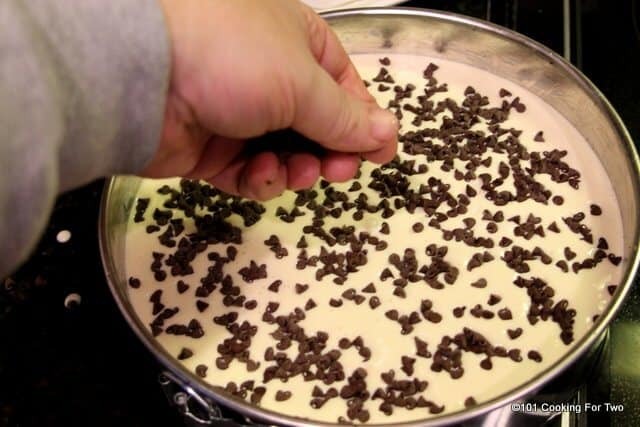 Add in some mini chocolate chips in the batter and on top, and you will be the talk of the party. Any thought of less than a five would be risking death from my wife who is in love with this. But I must agree. The crust will seem like it is not enough, but it is. If you want it to go up the side more, increase the amount by about 25%. 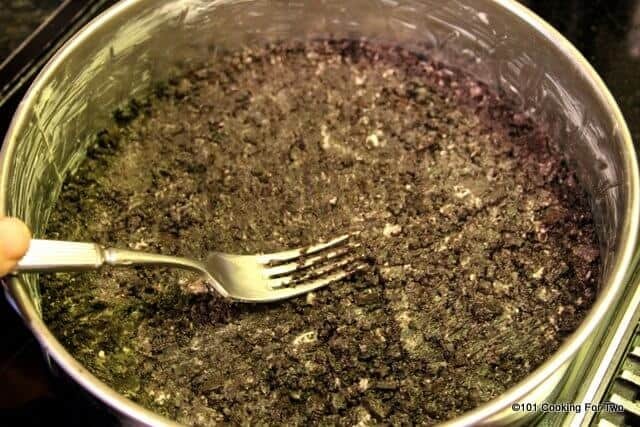 A graham cracker crust could also be used. I won’t cover how here. How to Prevent Cracks in Cheesecake. First, cracks in cheesecake happen. I have rarely had issues, and it is not the end of the world it does happen. Here are some tips if you want to avoid them. 1) The cheesecake will shrink a bit when it cools. If it sticks to the side while that happens, it will crack. So be sure to grease the pan well. You might also run a knife around the edge of the cake before cooling. 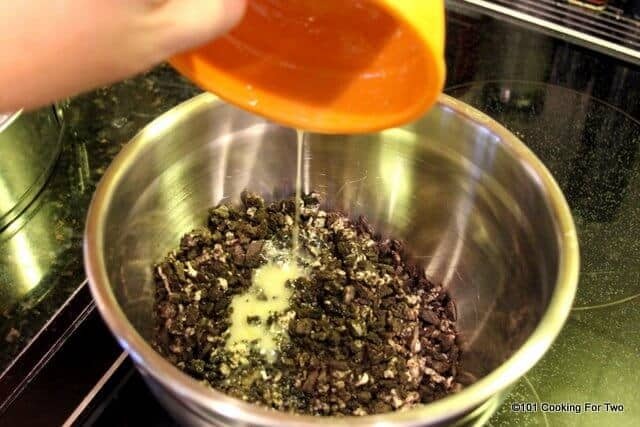 2) Air in the batter can cause cracks so don’t over mix. Be sure the cream cheese is warm so you can mix it easier and have no lumps. Mostly though, add the eggs last and don’t over mix since the eggs trap air easily. 3) Use a water bath. Humidity can help avoid cracks. I don’t usually do this. Just set the springform pan in a large pan of water. 4) Avoid opening the oven door to keep checking the cake. The drafts and temperature changes can lead to cracking. The edges will be slightly puffed and a little bit brown (see the last image). There will still be a 2-inch to 3-inch wobbly spot in the center. 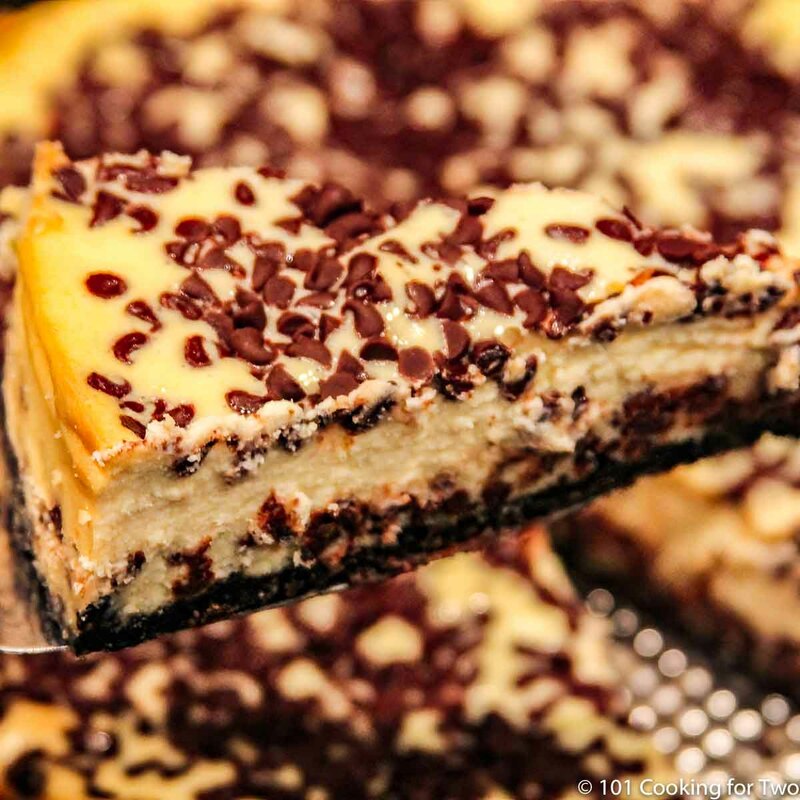 In general, an oven temperature for cheesecake should never be over 325. This recipe uses 300 degrees and if you are unsure of the accuracy of your oven, check it with an oven thermometer. If you don’t mind a hole in the surface, the internal temperature should be 150 when done. Never over 160 or it will definitely crack. 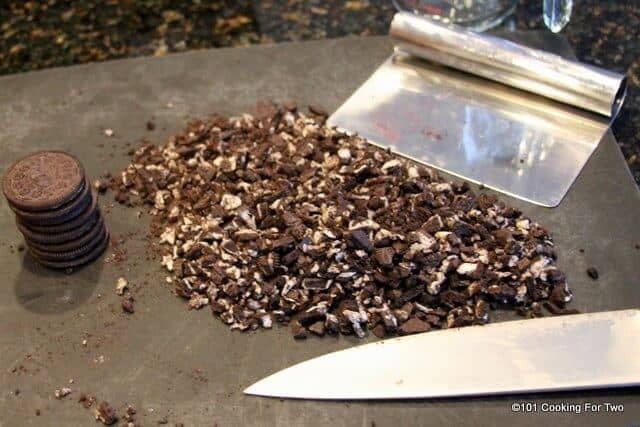 You could take out the chocolate chips and substitute other things if you want. The springform pan is a MUST. Sorry about that but you cannot be digging a slice out of a pan and expect it to be anything other than a mess. Only six common ingredients. Allow the cream cheese and eggs to rest for about 30 minutes at room temperature if you have time. For food safety reasons, do not let the eggs go for more than 30 minutes. Preheat oven to 300°. Crush 18 standard Oreo cookies (about 1 1/2 cups). 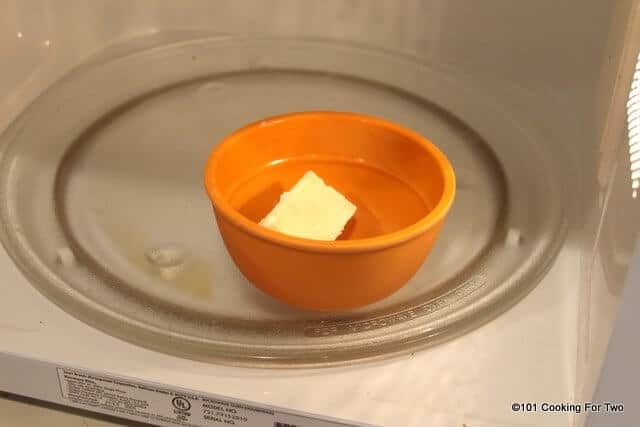 Melt 1/2 stick of butter (4 tablespoons) in a microwave for about 20 seconds until liquefied. 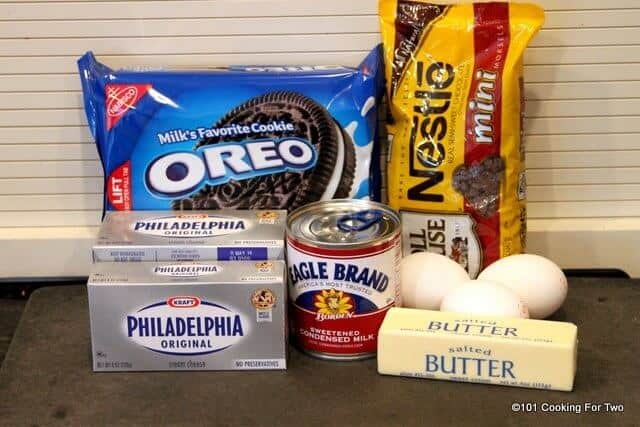 Mix the melted butter into crushed cookies and mix well. Grease a 9-inch springform pan. I like to use a small ziplock bag and about one tablespoon of butter. Crush the cookie/butter combo into the bottom of the pan using a fork. Break up any remaining larger pieces and be sure to get complete coverage. It will not look like enough, but it is. Now set this aside. Start with three 8 oz packages of cream cheese. Beat at moderate speed (4 on a stand mixer) for 2-3 minutes to make a little fluffy. 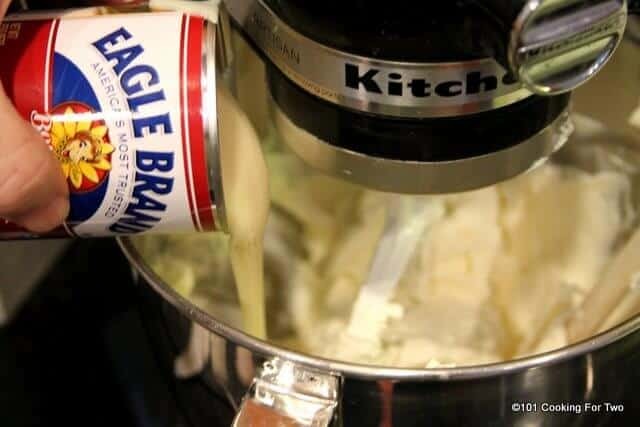 Add one 14 oz can sweetened condensed milk. 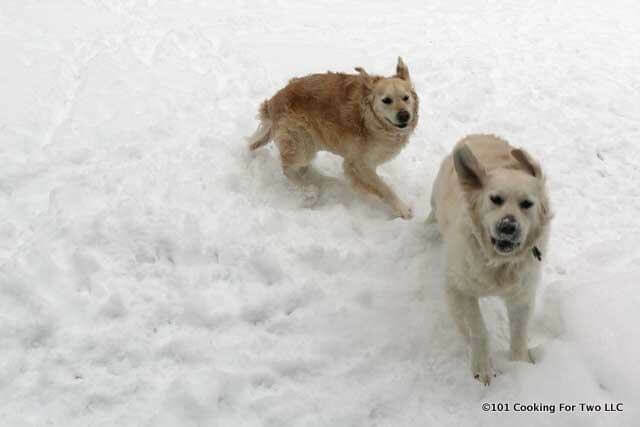 Mix on slower speed until combined. And now beat in the eggs one at a time until smooth but do not overbeat. Now fold in 1/2 of the 12oz pack of mini chocolate chips. Bake for 1 hour until edges are browning some, but the center may not look set. Do not go poking it with toothpicks or anything else to check for done. Cool in pan for 1 hour, before refrigerating for 2-3 hours. About 15 minutes into cooling, run a knife around edge to help release the pan later. Comment Note: This is not a “for two” recipe and will not scale down. It is a full-size 9-inch cheesecake. No comments please. Only six common ingredients. Allow 3 - 8oz packages of cream cheese and three eggs to rest for about 30 minutes at room temperature if you have time. For food safety reasons, do not let the eggs go for more than 30 minutes. Melt 1/2 stick of butter (4 tablespoons) in a microwave for about 20 seconds until liquefied and mix into to crushed cookies. 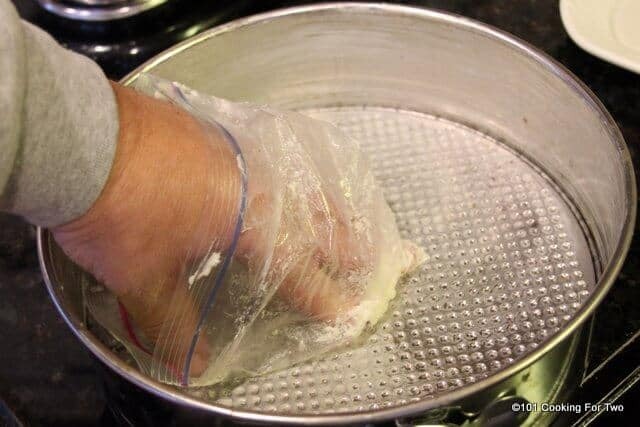 Grease a 9-inch springform pan with butter. 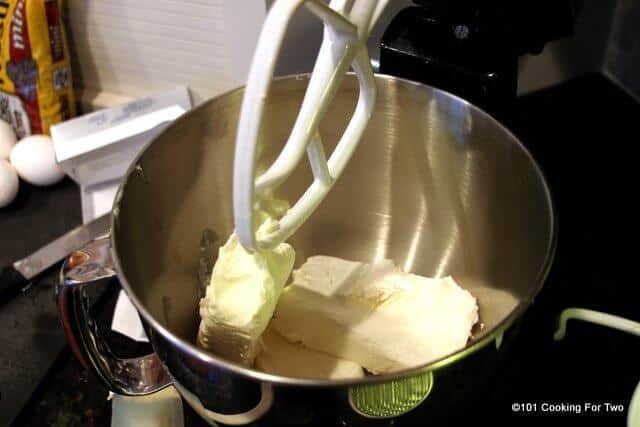 Add three 8 oz packages of cream cheese to a large mixing bowl. Beat at moderate speed (4 on a stand mixer) for 2-3 minutes to make a little fluffy. Pour batter into prepared pan. 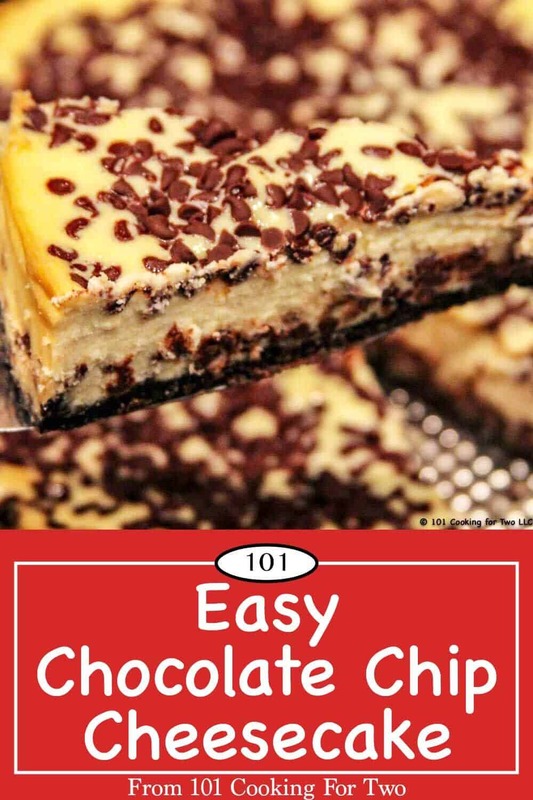 Top with remaining chocolate chips. Bake for 1 hour until edges are browning some, but the center may not look set. Do not go poking it with toothpicks or anything else to check for done. Cool in pan for 1 hour before refrigerating for 2-3 hours. About 15 minutes into cooling, run a knife around edge to help release the pan later. Allow the eggs and cream cheese to rest at room temperature for 30 minutes before starting. A springform pan is really must have for this recipe. Please do not double or cut in half. I have not tested the cooking time which will change. Watch the edge to tell if this is done. The edge will be browning some, but the center may not look set. Do not go poking it with toothpicks or anything else to check for done. Cool in pan for 1 hour either on the counter or by stopping the oven and opening the door before refrigerating for 2-3 hours. DO NOT cut this before properly cooled. 1-2 days is good. At 3 days, texture is changing some. But it freezes great, I have done that many times with this cake. So I would not cook more than 1 day ahead since there will be leftovers. Thanks for the comment and rating. 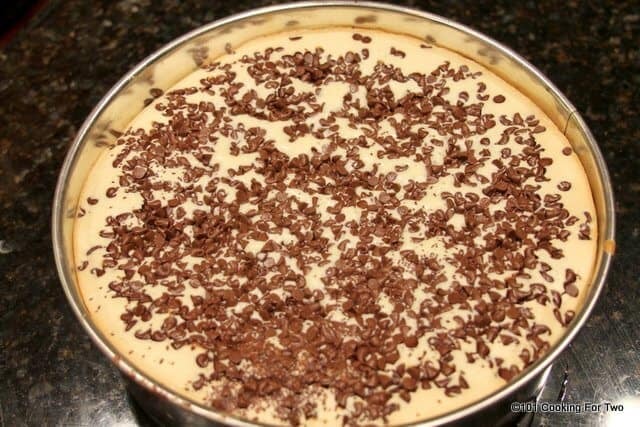 I love this cheesecake but it is just too good to make often. I have a pumpkin cheese cake post going up soon. So excited to try this! My best friend loves chocolate chip cheesecake and I’ve been wanting to make it for a surprise. So excited about trying this!! Thanks, DrDan! I’ve been making this for years. A couple of changes though. I add 2 tsps of vanilla to batter. I also coat choc chips in alittle flour (1tsp) before adding to batter. This helps them from sinking in cake. I bake at 325 for an hour with a pan of hot water (1 in deep) on rack below for moisture. Lastly, I turn off oven and leave it in oven for about 30-60 minutes with door ajar to cool down to ensure no cracking. Hope this helps!! Just let it cool at room temperature for an hour then refrigerate. Initially the center looks not done but it looks much better after cooled. We have never done the “crack the door” thing. It is a way to slow the cooling and decrease cracking. We have never had much of any cracking with this recipe. Looks good but how many calories? Do you know? Lots and Lots… I ran it through a calorie analyzer and it is about 7000 for the whole cake. That is a rough estimate and no guarantees, I usually like to do a hand calculation but seems about right. Excellent! There’s no dessert better than this! Yep…. Excellent…. not much else to say other than it really is not hard to do.